Three mining companies, one licensed and two said to be operating illegally, are locked in what has been described as a hopeless clash in the Bawku West District of the Upper East region. The companies are in fierce fight over some acres of land reported to be rich in gold and diamond among other minerals. The disputed land is at Zongoiri, deep inside a quiet forest fenced off by wild hills. The Upper East Regional Minister, Albert Abongo, who had issued an eviction directive to the miners some weeks ago only to see the illegal mining groups strongly defy it, says he now intends to deploy the military to the area to flush them out. RichPower Mining Ghana Limited, an associate of the Shaanxi Mining Ghana Limited, moved to the area in 2013 after securing a licence to do prospecting within thirty-eight thousand, nine hundred and nineteen (38, 919) acres. In February, 2016, two firms, the Sheng Da Group and the Nicodum Enterprise, dominated by Chinese expatriates, jointly invaded RichPower’s concession and, without a licence, claimed twenty acres from it to mine. The Minerals Commission has described both the Sheng Da Group (a Chinese company) and the Nicodum Enterprise (a Ghanaian establishment) as operating illegally in the area. The Regional Minister had met with the two “illegal” companies at his office in Bolgatanga, the regional capital, on Thursday May 19, this year, and asked them to discontinue their mining activities. And they were expected to leave the area soon after. But the miners, about four weeks after the order was issued, have remained there to date for a dare. Some journalists toured the community Tuesday and were told by observers, who pointed at stockpiles and beds of grey ore around and also called attention to the sounds of heavy machines at the site as fresh evidence of work being done, that the miners had defied government’s order to quit. The supervisor for the “illegal” groups, Dauda Jawara, who is also an influential indigene of the area, was around. The comments that met questions posed to him by newsmen did not only paint a community not prepared to surrender the invaded acres back to the accredited concessioner but also portrayed a people prepared to swing into raw war if RichPower eventually reclaims the entire concession. “Even when we are going to die, we will write to our children, swear [by] our gods that RichPower will never come here. If you make something wrong here, anytime RichPower [comes] here, unless you kill us. We attacked police before. You know that,” Mr. Jawara, directing his venom at RichPower officials, avowed. Before the “illegal” miners invaded the concession, RichPower had come under perhaps the most nerve-wracking attack ever staged in the community. It happened on Tuesday 7th July, 2015. Some sections of the area disliked the occupation of their minerals-rich land by the company and decided to drive it away from the community. Young men and elderly folks, too many to count, armed themselves with spears, guns and kegs of petrol, chanting protest slogans. Some hung behind them sacks full of arrows and held forward bows ready to shoot. Singing war songs in a delirious motion whilst piercing the air with sharp machetes, their numbers increased from different directions as they marched, with the ground trembling under their feet, to the site. They chased employees of the company away and set five drill rigs, each worth 650,000 dollars, on fire. A police squad that surfaced at the scene fled black at a blind speed with all windscreens of their vehicles smashed by the angry mob as the red flames in the background reduced the equipment to ashes. Twenty people were arrested later and put before court in a case still running to date. Seventeen among those identified in the attack are at large. The arrest and the ongoing prosecution of the suspects have heightened clouds of tension in the area. Maxwell Wooma, who manages public affairs for both RichPower and Shaanxi, came under what he considered as a threat on his life from Mr. Jawara, the supervisor, at the site. Mr. Jawara, who persistently said Mr. Wooma was the brain engineering forces against the unlicensed companies he supervised ever since they came to lodge in the area, openly told the public affairs officer to his face, and in front of the press, that it was time to let the gods of the land hear about the discomfort he was causing to the illegal miners. “This man is disturbing. I was told long time that you are disturbing. We have gods. We will take your name, give our gods and we’ll see. If you like money more than your life, we will take your name, give our gods. We have about six gods here. You are growing horns,” Mr. Jawara said angrily. Mr. Wooma, who held his ground, maintained he was only using the right channels to put things right. He explained to the press afterwards that the illegal miners came in after RichPower had gone on a temporary break in the aftermath of the July 2015 violent attack on the company. “We were surprised that somewhere three months ago, some illegal people had come into Zongoiri to do some mining. So, we approached the chief to ask him whether he was aware of the development. He said he was aware but he was fed up that we were still not resuming work in his community. So, every time we met him, we kept on telling him that we were unable to start work immediately because ‘we don’t have new rigs to come to do work now; but the concession is ours, be patient, when we are able to repair the rigs and we get the expatriates with the capital, we will come back to continue with the drilling that we were doing. “Unfortunately, it developed nastier. We heard that the people had brought excavators and pay loaders and had stationed somewhere on our concession. There is evidence that they have started working. And it is time to stem the tide,” Mr. Wooma relayed, adding that the company would soon secure a court injunction restraining the illegal miners from operating at the site whilst looking to government to come in. A voice believed to be that of the Chief of Zongoiri, Naba Suguru, known in private life as David Akparibo, is on a tape telling RichPower officials in a telephone conversation that he brought the “illegal” miners to the community because RichPower turned down his request for financial favours. He is also quoted to have said he invited the illegal mining groups because “I want money”. Journalists who went to his palace Tuesday, accompanied by some officials of the RichPower Mining Ghana Limited, to establish the truth around the alleged statement were shunned. The newsmen had barely announced the purpose of their visit when the chief spoke to his elders in Kusaal, the language of the area, and walked out angrily on the media. Interpreting the chief’s remarks, one of his elders told the press at the palace the chief said he only had an appointment with the Chief Executive Officer of the RichPower Mining Ghana Limited (who was not in the region at the time). The Managing Director of the Nicodum Enterprise, Amin Ayamga, told Starr News the traditional leader only walked out because RichPower officials were in the journalists’ company. The District Chief Executive for Bawku West, Simon Ayande Agbango, who is said to have received instructions from the Regional Minister to get the groups out of the area, reportedly returned after he had visited the site only to say he could not do so. He allegedly told RichPower officials to find a solution to the problem themselves. But he refuted the allegation in an interview with Starr News, saying he did as instructed by the Regional Minister. The Managing Director of the Nicodum Enterprise told Starr News the chief had done nothing wrong. “This area is not a mining concession yet. It hasn’t been given to anybody to do any mining as [the] RichPower [company] is claiming. They only went for a prospecting licence. Looking at the Mining Act, after prospecting, you should shed off over 30% of the land. So, if the chief demands twenty acres of the land, it’s not farfetched from the law,” Mr. Ayamga pointed out, adding that a vehicle belonging the community was also set ablaze by “workers of Shaanxi” after the 2015 mob attack on RichPower. The presence of the “illegal” miners is widely seen as a threat to the environment with several economic trees reportedly destroyed so far. There is a river, only about 1.5 kilometres away from where the miners are said to be involved in open surface mining with chemicals poisonous to water bodies. Development watchers see the possible pollution of the river with mining chemicals as a recipe for future troubles. “We’ve gone to the scene, identified that this is what is there. We immediately stopped them, told them to suspend operation. In addition to that, officially we’ve written to the district assembly which holds the DISEC (District Security Council) that is an illegal operation that is going on, so they should immediately stop it. They have no locus there. 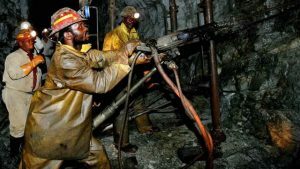 They have not been given any permit to do that,” the Upper East Regional Officer of the Minerals Commission, Ernest Okyere, told the press in Bolgatanga. The Regional Minister has fired strong warnings, saying he will deploy military officers to the area if the “illegal” miners fail to leave the site in seven days. “I will get the police to go there and give them warning to leave. That is what I intend to do. Then, we will give them another week or two and if they don’t move I will send the military and the police, a joint action of the military and police. But let me give them the opportunity to organise and leave the place,” Mr. Abongo told Starr News. There are fears about the future. Signals picked by Starr News indicate that the illegal miners, if forced out of the site with no immediate arrangements to resettle them with a licence to mine elsewhere, would together with some dissatisfied locals and devoted subjects of the chief deliver endless grief to RichPower even under 24-hour military protection.